At the beginning of the XIX century the Imperial style, characterized by high waist, puff sleeves, smooth and sinuous lines, so popular at the Court of the Emperor Napoleon Bonaparte, began to evolve in the Romantic style. 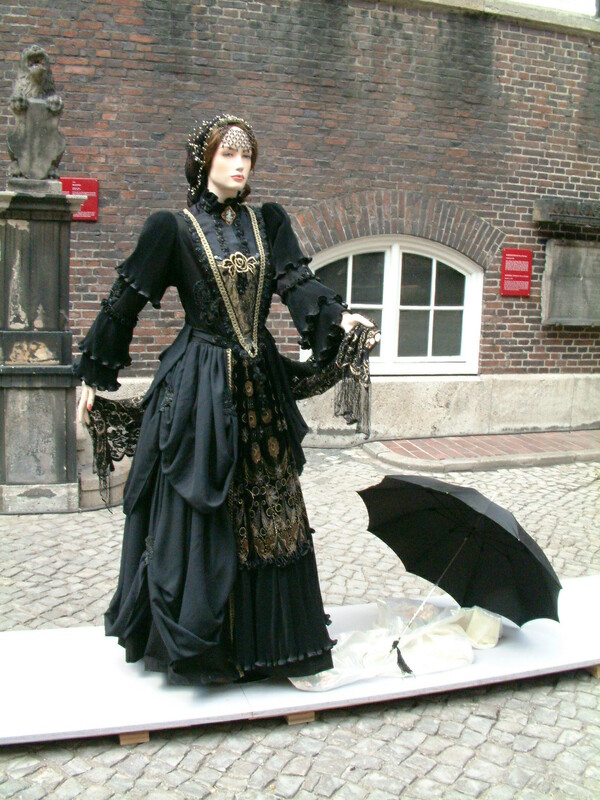 The nineteenth century fashion is a continuous succession of changes, mirroring the many political moral and cultural upheavals that characterized the century. Light and comfortable clothes gradually disappear, the necklines went from square to pointy. Broad, shoulder to shoulder necklines appear only in evening dresses. Around 1820 the chest, neck and shoulders are kept covered; skirts widen shorten leaving the ankles uncovered, until, in the 40s, they become longer, spacious and richly pleated. The waistline rises and the whalebone busts come back in vogue. The sleeves, wide and puffy from the shoulder to the elbow, long and narrow down to the wrist, lengthen to make the line of the shoulders steeper. Undergarments acquire particular importance: shirts and knickers become indispensable style accessories. Petticoats are worn crisp and starched. The hats are bulky and have large brims decorated with veils, flowers and feathers; all this is accompanied by small parasols, often decorated with lace. Gloves are an essential accessory and they vary in shape and pattern, depending on the clothes and occasions. The male outfit usually has sober colors (black, dark blue, brown) and includes a tailcoat worn tight at the waist, a redingote with a wide brim, waistcoat and trousers with a slightly shorter and tubilar cut. The most popular hats for men are the top hat and the homburg, combined with sticks and tie clips, watch and jewel buttons, and overcoat with a large cloak.